Combines the ornate curves of classic French design with a delicate painted finish, creating a collection of chic cream furniture. TThe Bella Brushed Oak and Cream Painted bedroom range features a solid brushed oak top that complements the smooth, cream painted base. Bella’s French look is enhanced by carved feet and undulating skirts, curved edges to the tops, and smooth bevelled edges to the drawers. Each piece is made from 100% solid hardwood, and drawers have dovetail joints for strength. All our drawers have hardwood backs and bases for exceptional strength and durability. The Bella range of cream furniture is a beautiful combination of solid oak and acacia. Acacia is used in the finest furniture due to its inherent strength and smooth finish, making it especially suitable for a painted finish. Our painted furniture is still solid hardwood. The wood we use makes a very flat surface, ideal for a smooth painted finish. 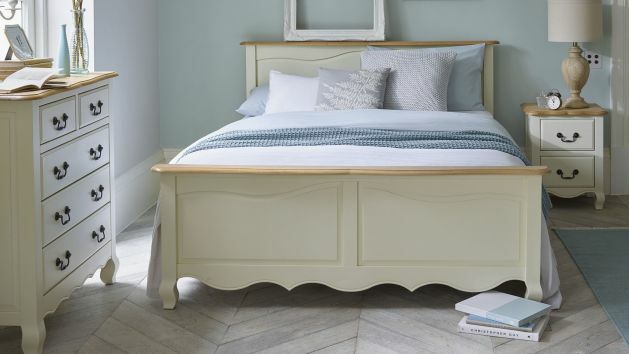 For more information on Bella, browse the pieces in this cream furniture range. And remember, we always offer free delivery to the room you choose.